Theorem 1 (Cobham, 1969). If an infinite set is both -automatic and -automatic, then and are multiplicatively dependent. Theorem 2. 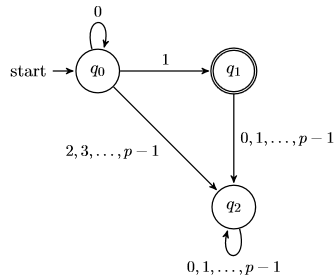 If is -automatic, then and are multiplicatively dependent. Theorem 3. The set in theorem 2 is -automatic. This shows that is -automatic. Theorem. If is -automatic, then it is -automatic for each . Proof. Since is -automatic, there exists a DFA such that . Now we construct a new DFA by defining inductively for each and . This shows that is -automatic. for each . The right-hand-side above is constant, and is divisible by for each . So it must be identically , i.e. Since , we have . Hence divides . If we write , then . So . As a result, . Therefore , i.e. and are multiplicatively dependent, as required.